Luke 10:2 reminds us of the uncomfortable truth about recruiting volunteers: there will always be more work than there are people willing to do the work. Obviously that was true in the first century and it continues to this day. However, just because recruiting more volunteers will always be difficult, it does not mean that we cannot improve! There are some things we can do though to increase the number of people in our congregations that are mobilized into service. Sure, you know that you need two people this Sunday in the four-year-olds class because Adam and Eve Churchgoer are on the Disney cruise they’ve been talking about for six months. I’m talking about a bigger picture view that you need to understand. Most church leaders have a tunnel-vision view on the volunteers in the church. Whatever need is most pressing gets all the attention and that need changes every week. The better way to think about the volunteer needs of the church is to go through every ministry and create a master list that can then be maintained easily. Begin to document every position in the church by creating an organizational chart. List out every ministry area and how many volunteers are needed in each area. This will show you a wonderful, big picture view on how many people you need and where the gaps are. Your volunteer org chart should then be overlaid with your staff org chart so you can also easily see who reports to whom and who is responsible for recruiting and training. For small-church leaders, it all comes back to you, but it’s still a great tool to have written down. Go the extra mile and also create a “next step” org chart and include what position you would hire next if you could and how the team would shift with that new role in place. That’s a vision piece and it will be a good exercise to do. 2. Communicate the Need through Vision, Not Manipulation! The old “twist their arm” methodology might work in the short-term, but a long-term volunteer management system comes from a well-communicated vision. Vision has several forms to it that all fit together. There’s the really big picture long-term vision of the church, but there needs to be some shorter-term vision points that bring things into greater clarity too. I’m talking about some 3-5 year points and also some one-year things to keep people focused. Each part directs to the next and helps build momentum. 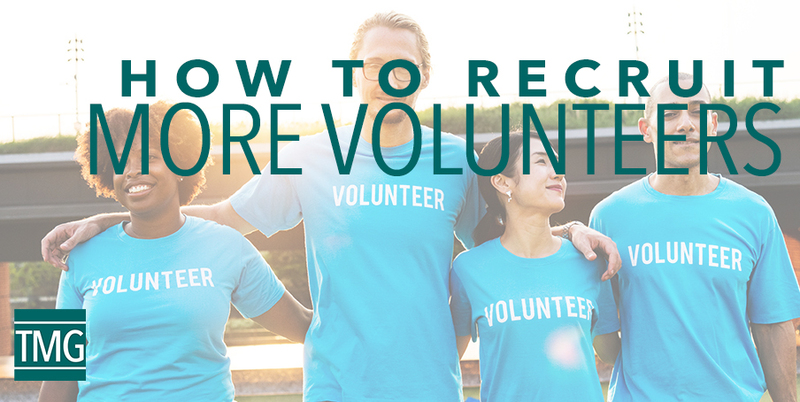 In the case of volunteer recruitment, people are much more likely to get involved in something that has a bigger meaning to it. It gives them an opportunity to participate in something that God is doing in your church. It’s a motivator. Yes, we need two people for Adam and Eve’s four-year-olds class or those kids will have to be combined with Abram and Sarai’s six-year-olds class this Sunday. Better to have had two sets of leaders for the four-year-olds already so your backup was on deck and ready to go. Taking the time to continually cast vision for the church and making sure that the vision is understood at all levels will go a long way in staffing all your positions. Keep reading in Luke 10:2, “Ask the Lord of the harvest, therefore, to send out workers into his harvest field.” That doesn’t just apply to a missionary going to the other side of the world. It starts in our Jerusalem, Judea, Samaria and to the ends of the earth (Acts 1:8). But even before that it starts down the hall from your office. Pray without ceasing, of course, but I’m suggesting you do the necessary work first and then earnestly ask God to raise people up for the specific needs of your church and gather others to pray over the needs as well. Every church should develop a system that allows people to gain understanding in how the Lord has gifted them for service. Beyond just spiritual gifts we also look at passion, experience, natural talents and temperament. Consider Saddleback’s classic “SHAPE” framework. At The Malphurs Group, we use the term Divine Design. This is the point in which we intersect with step one. We take what we know about an individual and we match them to potential ministry positions. There are, of course, things that need to be done in the church that are not a perfect fit for everyone, such as Adam and Eve’s four-year-olds class. I do believe, however, that God equips churches with the right people for ministry. There are many more details to cover on this topic and we certainly cannot overlook developing leaders at all levels of our churches, so I encourage you to continue learning this very important part of church leadership. Join us for our upcoming webinar on Recruiting More Volunteers on Thursday, November 15 at 11am Eastern. This is a free training. Sign-up today as space is limited. Thank you, Tracy! The correct date is November 15th. We have corrected the registration page.